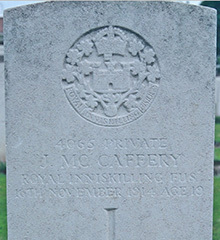 John Joseph McCaffery was the eldest son of John and Anne McCaffrey. 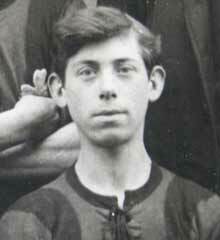 He was born in Moyglass, County Fermanagh on 10th July 1895. He was second of six children, all born in the Ely area. By 1911, the family had moved to Portadown. The family then moved on to live in at 26 Blackhill, Cookstown. John worked at Adair’s Mill at Greenvale, Cookstown. Private John Joseph McCaffrey was serving with the 2nd Battalion of the Royal Inniskilling Fusiliers when he died of wounds on Monday 16th November 1914.